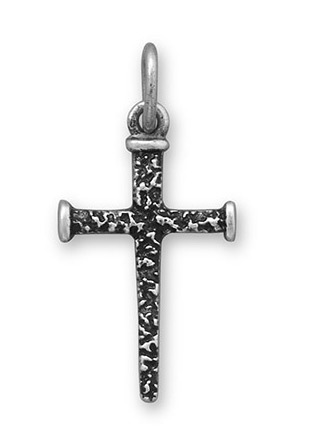 Black oxidized and textured cross of nails Christian pendant crafted in .925 sterling silver. It was at Calvary, that they nailed Jesus to the Cross, yet death had no power to hold the Son of God in the grave. And the same Spirit that raised Jesus from the dead, will raise us also who have put their faith and trust in the Lord Jesus Christ. "But if the Spirit of him that raised up Jesus from the dead dwell in you, he that raised up Christ from the dead shall also quicken your mortal bodies by his Spirit that dwelleth in you" (Romans 8:11). Therefore, comfort one another with these words. Apples of Gold Jewelry is a Christian company, who's goal is to glorify the Lord Jesus in all that we do. Every order comes with free shipping in the U.S. (international delivery also available) and our signature 45-day return policy. Cross of Nails pendant measures 26mm x 12.5mm in size (1" tall x 1/2" wide). We guarantee our Oxidized Cross of Nails Pendant, Sterling Silver to be high quality, authentic jewelry, as described above.